Gazetted as a national monument in 1990, Caldwell House is one of the oldest buildings in Singapore. Its neoclassical style design is one of the few surviving works of renowned architect, G.D Coleman. 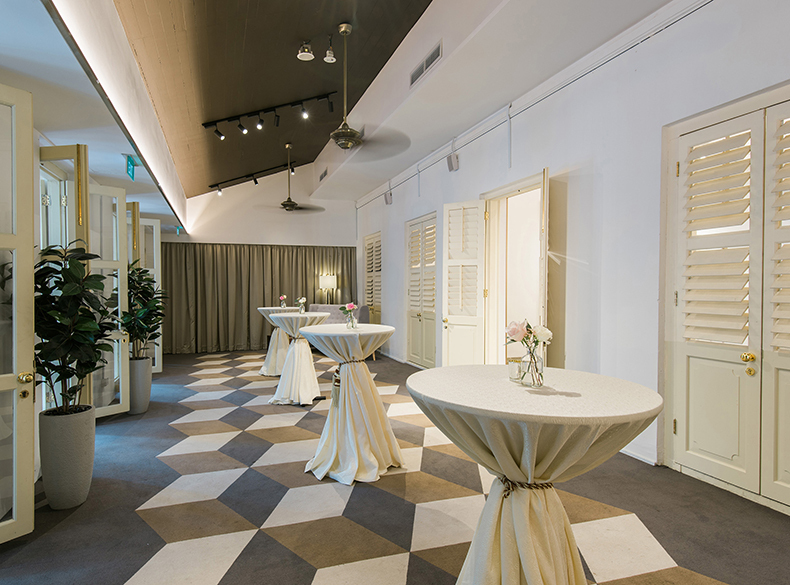 The Grand Gallery on level 2, renamed Alcove is managed by Watabe Wedding Singapore. With its unique semi-circular exterior and large Doric columns supporting a vaulted timber ceiling, Alcove is well furnished and suitable for small parties of about 30 to 100 guests. Its modern furnishing allows room for versatility, an ideal location for corporate and wedding events. Within the venue itself, we have meticulously prepared a comfortable suite, fitted with all the necessities for the bride’s use. This exclusively private room for the bride can be used as a changing and makeup room or just a quiet sanctuary for the bride to reflect on the day’s events.